Snow isn't white; it's translucent and more Weird but True Facts! Weird but true facts are fun to learn at any age. Acquiring knowledge always feels good, but it’s those quirky, random gems that make our eyes widen and remind us that there’s still so much to learn about the world. Books were sent to me for this post, but all opinions are my own. 10 Weird but True Facts – Did you know? Did you know that scientists think that the center of the moon might be squishy? I didn’t. Did I need to know that? No, but it could help fill the next awkward silence I come about at a gathering. A narwhal’s tusk tooth grows through its upper lip. An interesting fact to know about the unicorns of the sea. Snow isn’t white; it’s translucent. It’s the perfect time of year for an experiment! Prehistoric guinea pigs were as big as cows. Also, definitely not as cuddly. Scientists think that 20 billion planets in our galaxy could support alien life. Billion, with a B. That’s fascinating. A geep is part goat and part sheep. I am now on a quest to meet one. The first bubble gum, made in 1906, was called Blibber-Blubber. That’s what I shall call it from this day forward. Americans are more likely to win a million dollars in the lottery than to get hit by lightning. Pretty sure that disproves the common saying that suggests the opposite. Today’s cell phones are more powerful than the computers that sent astronauts to the moon. Wow, I have a lot of questions. Where did I learn all these fun facts? From the popular line of National Geographic Kids books. Although most of the books are recommended for ages 8-12, I found myself flipping through the pages in awe. 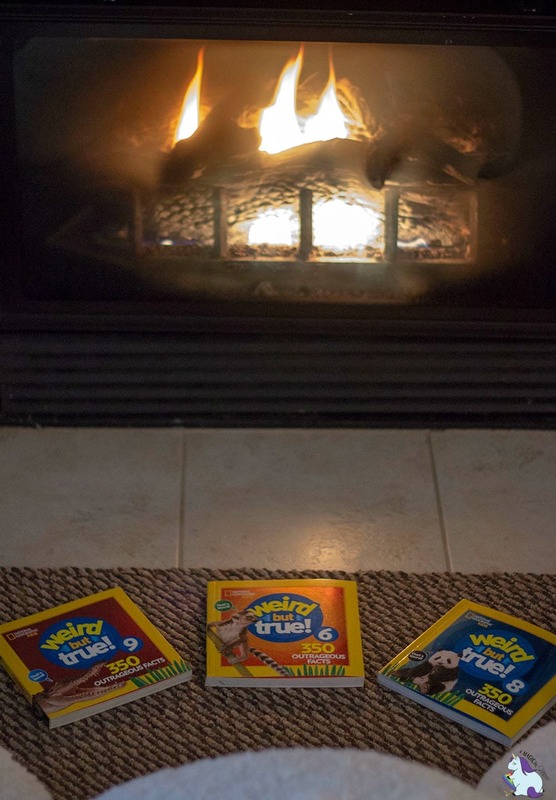 Whether you homeschool your kids or like to cozy up with the family to read on cold, snowy nights, National Geographic Kids books are packed with facts paired with stunning visuals. Each fact includes zero explanation which leads to more discussion and the need for further research. Learning interesting tidbits of info is the perfect way to open the mind and ignite curiosity. You can send family members on mini-research projects to gather more info about the hows and whys of their favorite facts. Trust me; I spoiled nothing by listing ten facts. 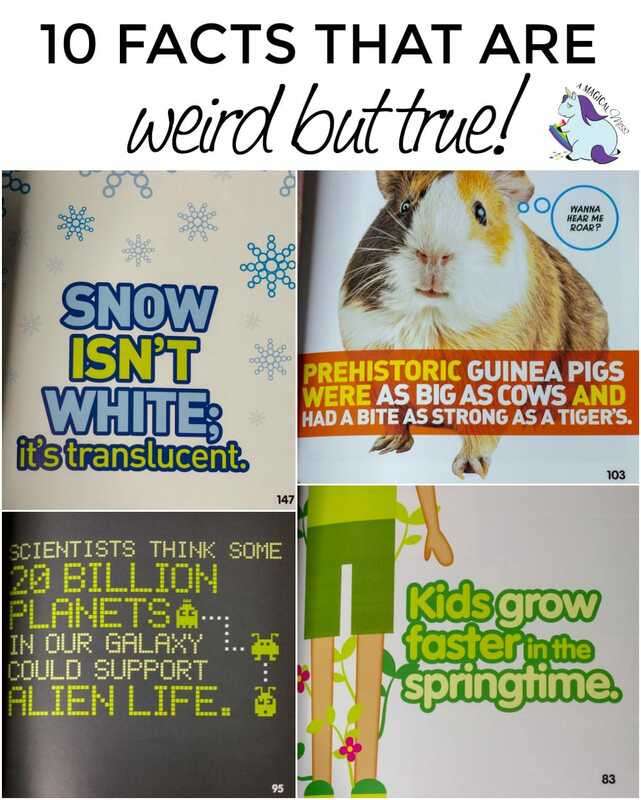 There are thousands of weird but true facts in the still-expanding series of National Geographic Kids books. It’s no surprise at all that the Weird but True! book franchise is considered the gold standard in educational and entertaining books for kids. With over 5 million copies sold, published in over 15 different languages, and featuring a broad range of topics from science to food to pop culture, Weird But True! books capture kids’ attention and get them reading. 10 Weird but True! books from the main series. Book number 10 is new, and books 1-9 were refreshed and expanded to include 50 more facts than the originals. Each book contains 350 facts! Weird But True! Know-It-All Greek Mythology. Everything kids want to know about their favorite Greek gods, heroes, monsters, quests, and famous philosophers. Weird But True! Cool and Crazy Sticker Doodle Book. Unleash creativity with DIY weirdness in this book. From doodling prompts to crosswords, mazes, picture puzzles, and stickers, this book has kids learning with every flip of the page. Weird but True! Christmas. Similar to the main series, but with one overall theme. This book contains festive and far-out facts about Christmas, making it a fabulous stocking stuffer idea. Giveaway ended! 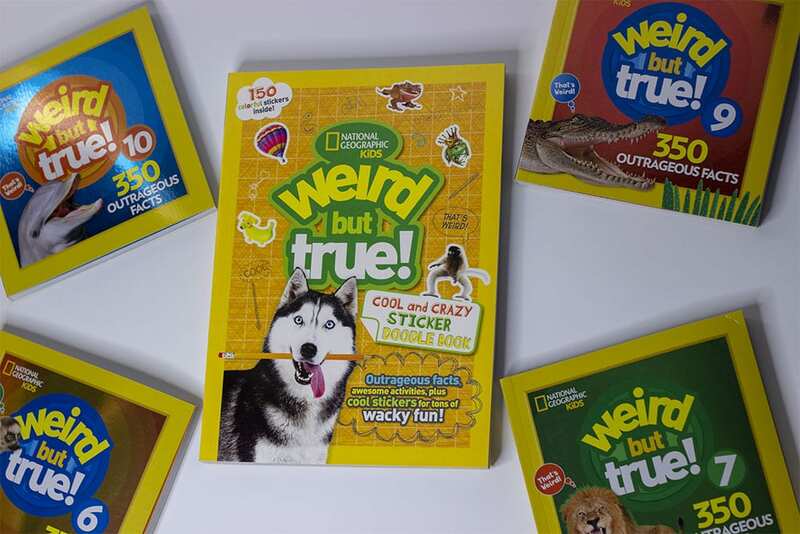 Happy winner ==> Tiffany N.
Who do you know who’d love to learn weird but true facts? Kids grow faster in springtime?? I never knew that these facts are awesome! Reading about this series, I have learned that you can make diamonds from peanut butter! My daughter really loves NatGeo books! This series is one of her favorites! These books look like they would be really fun to read with my kids. I love knowing little things that not everyone knows about and sharing it with my friends and family. 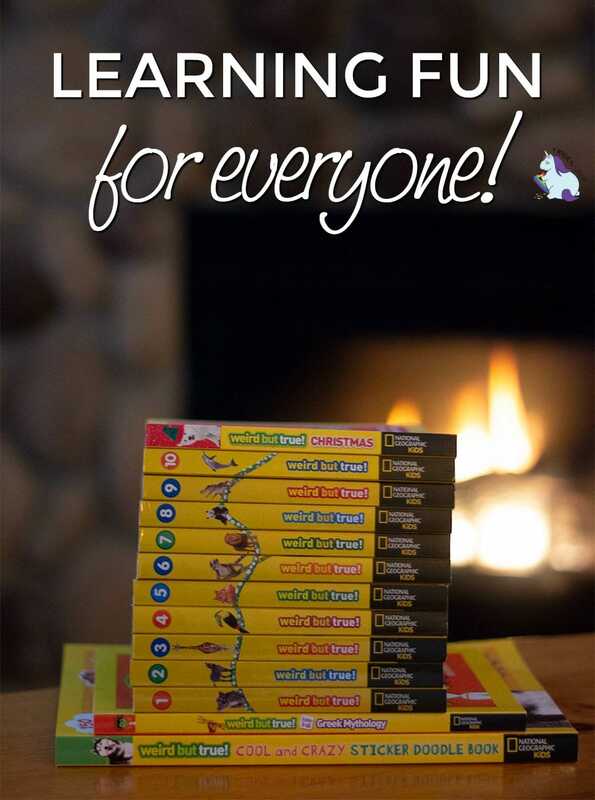 My daughter would definitely be devouring these books fast! Reading is both fun and educational. I think these books would be great ice breakers and conversation starters for holiday family gatherings or parties. These look like they great books. I know my grandchildren would love reading them and learning some fun facts too. 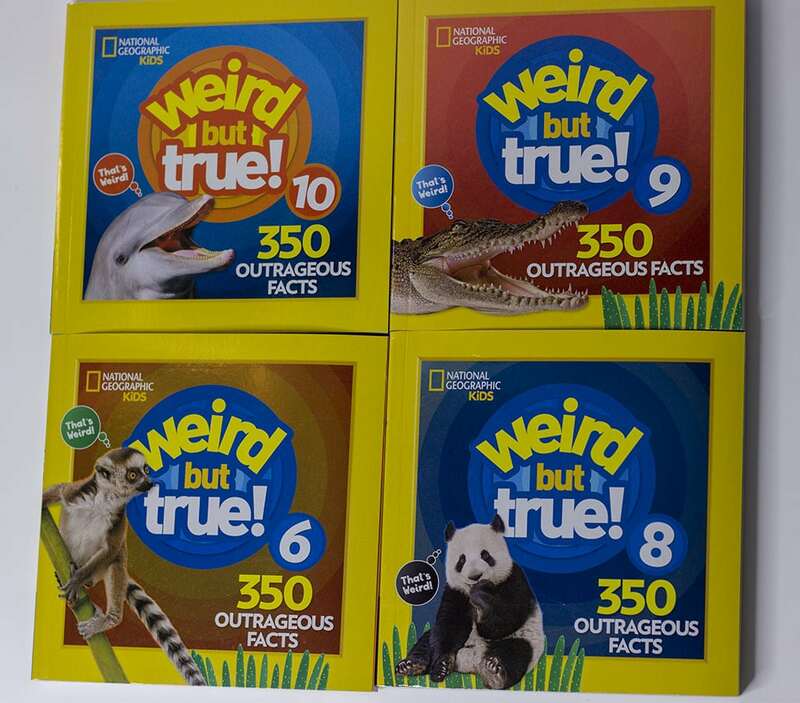 My nieces and nephews would love these, especially since they’re filled with facts most adults don’t know, so the kids will feel like the facts are extra-special. My son and daughters love animals and facts. They would really enjoy reading all these books! My kids love these books. Every year at the school book fair they buy one. I learn a lot of interesting facts! My son loves these books. They are fun to read and educational too. I want this for my nephew! I think these books would be so fun. Great photos and information al in one! My son (who is now 18) used to love these types of books. At book fairs, he always gravitated towards Weird but True, Ripley’s, and Guinness Books. Now I have a grandson named Jojo who loves these types of books – he’s gladly inherited all of my son’s books and is always looking for more. These are seriously the coolest books! My son first found one at a school book fair years ago and has been obsessed ever since.Now he reads them with his little sister and they can spend literally hours just reading facts and looking at the pictures.Love these books!